Early Symptoms of Kidney Disease and How to Keep Your Kidneys Healthy. Kidneys play essential roles in the body, including purification of blood and elimination of toxins from the body. Kidney malfunction can lead to toxin accumulation in the body which can cause serious health conditions. The number of people with diagnosed kidney disease in the United States is 20 million, and the number continues to grow all the time. Kidneys have the ability to balance the water levels in the body as they participate in the chemical breakdown of the urine. Lack of water can cause the kidneys to leave the water in the body instead of excreting it. Kidneys eliminate the toxins, excess salts and urea, a nitrogen-based waste which is created due to the normal cell metabolism. Urea is created in the liver and distributed to through the blood to the kidneys in order to be eliminated. The lack of oxygen in the kidneys leads to the creation of erythroprotein, a hormone that stimulates the bone marrow to create more erythrocytes (oxygen-carrying red blood cells). The kidneys need constant normal pressure in order to filter the blood properly. Therefore, low blood pressure causes the kidneys to increase the pressure. Acids are normal products of cell metabolism which and the kidneys are responsible for their balance in the body. There are many factors which can lead to kidney disease, including diabetes, infection and hypertension. High blood pressure is one of the main causes of kidney disease and therefore you should try to keep the blood sugar and pressure levels in normal. 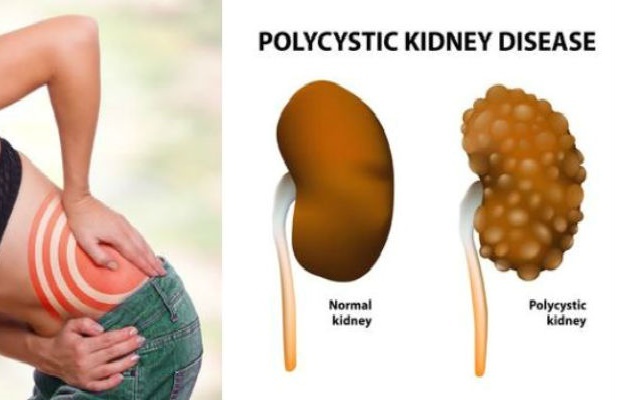 Furthermore, kidney disease can be developed due to hereditary factors which means that if someone in your family has suffered from kidney disease, the chances that you will have kidney disease are increased. Frequent alcohol consumption, smoking, overuse of medications or lack of physical activity can also lead to kidney disease. Generally, clear symptoms of kidney disease appear in the late stages, when there is almost a kidney failure or when there are excess proteins in the urine. In the early stages, the symptoms are usually unnoticeable and that is why people do not pay much attention to them. Statistically, only 10% of patients with kidney disease know that they have it. Also, kidneys they easily get used to the infection which is how they lose their function. Therefore, it is very important to recognize the early signs of kidney disease in order to prevent further kidney damage. If you notice any of the above-mentioned symptoms you should consult your doctor immediately in order to prevent further development of the disease. How to prevent kidney disease and strengthen your kidneys? Kidney disease is a serious health issue which can have a number of health consequences. Therefore, you should make some changes in order to prevent the incidence of kidney disease. Make sure you have healthy and well-balanced diet, low in saturated fat and cholesterol. Do not starve! Your kidneys need proper enough calorie intake in order to function properly. Limit the intake of salt and potassium. Consume plenty of apples, watermelon and berries. Keep your blood pressure in normal levels because it is the essential factor for proper kidney function. Take supplements in case of calcium and vitamin D efficiency. Avoid analgesics and steroids because they can damage your kidneys. Do regular exercises in order to maintain healthy weight and reduce the risk of diabetes, obesity and hypertension.